Years ago, schools offered metal and wood shop. For parents, if you were lucky enough to have taken a shop class when you were a kid, you probably remember the excitement you experienced when you actually created something. With 3D printing, it is even more exciting. There are easy-to-use and free design programs available. With these programs and your child's imagination, they can bring their ideas to life in the virtual computer world and then brought into reality with 3D printing.. This is a 2 workshop series. 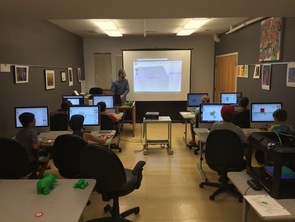 During each session, design skills will be taught using TinkerCAD. TinkerCAD is a free, web-based design program. 101 - Introduction to 3D Printing & Design: This session will give students a understanding of 3D printing and how it is being used. Students will design an object with a base and with their name on it, which could be used to clip on a backpack or just display. Since it is Christmas season, your student can opt to make a Christmas ornament. 102 - Advanced TinkerCAD: Building on the basic skills from 101, TinkerCAD will be explored in detail. The project for this session is to design a house with walls, windows, doors and whatever they can think of. Basic engineering ideas are introduced like "scale". Students will receive a 3D print of each project (so four in all). 3D printing is very cool, but it is not fast. 3D prints will be available the following week (and before the Christmas break). They will also receive a 3D print at the first session (which they can take home) so they have a frame of reference for 3D printing.. The total cost for the 2-session workshop that includes all of the 3D prints is $50. A 3D design is the virtual representation of something in the real world. There are many ways to create a design. The most common is with a CAD program like TinkerCAD, OnShape or SOLIDWORKS. Another way is to draw something by hand and then digitize it. Art to Thing is a single session workshop where students will draw an object with a Sharpie on a regular piece of paper. Then using iPads and the app PrintShop, they will capture their image with the iPad. In the app, they will be able to add the 3rd dimension to make it 3D and do other manipulations. You may have heard of STEM - Science Technology Engineering Math. There is another term - STEAM, the A is for Art. Adding the A to STEM is exactly what this workshop is about. This workshop also has a "giving back" component. A second 3D print of their design will be made which will become part of a mobile. The mobile will us used in the upcoming LCC Day School auction. The total cost for the single session is $25 which includes the two 3D prints, one to take home and one for the class project. ​Here is one of our workshops that was held at the Morean Arts Center. For instructors, we have USF mechanical engineering students.. They understand design and can relate well to kids.